Grill peppers, turning frequently until evenly charred on all sides (about 5-7 minutes). Put the charred peppers into a paper bag for 10 minutes, and then peel charred skins. Cut open; discard stems and seeds. Place peeled and seeded pepper fillets into the food processor. Cut out the stems of each tomato, and blanch in salted boiling water for 1 minute and peel off the skins. Cut skinned tomatoes in quarters and squeeze out seeds from the tomato pieces and reserve the liquid in a separate bowl. Place peeled and seeded tomato fillets in the food processor with the peppers. Peel the cucumbers, and cut them in half the long way. Working with a teaspoon, scoop out the cucumber seeds. Cut the cucumbers into the coarse chunks, and add them to the food processor. Put the bread in a bowl of cold water for 30 seconds, then squeeze the water out. Add the bread to the food processor, along with the garlic, onion, olive oil, vinegar and tomato paste. Process for at least 2 minutes, or until a smooth puree is achieved. Chill. 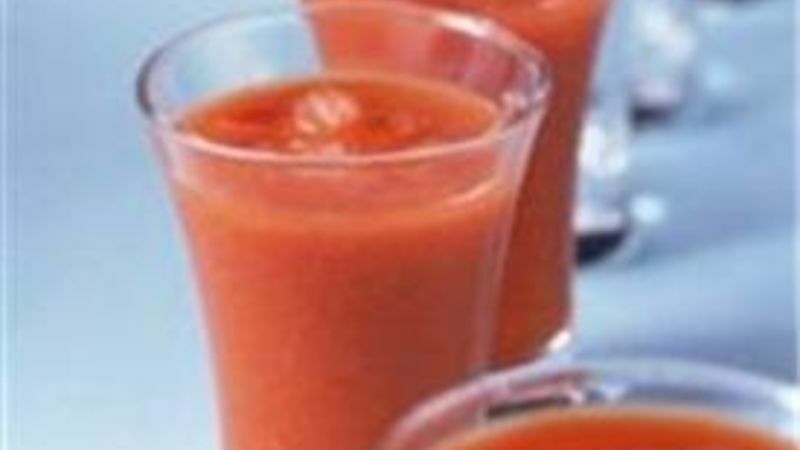 (The Gazpacho, that is, for 2-4 hrs or more if you can stand it). Before serving, blend it again for a minute or two then strain it through a medium fine strainer. Add salt, pepper and maybe vinegar and olive oil, if you so please. That oil looks real nice drizzled over the top, like they do on TV.